Remember my church’s cookie outreach? Here’s the rest of the story. 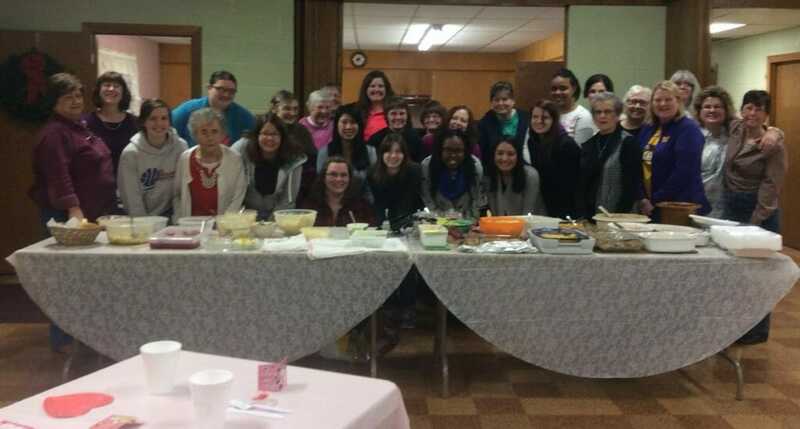 Some time ago, I wrote a blog called Anne’s Iced Sugar Cookies where I shared about my church’s partnership with a campus ministry to the Western Illinois University. Campus Students for Christ set up a booth at various locations throughout one week and offered free cookies to passers-by. Our church ladies agreed to provide the cookies. So enthusiastic about the project, the ladies became a cookie baking machine, turning out over 900 cookies! After the week–long outreach, CSC still had bags of cookies stuffed in the campus house freezer. Fast forward to the beginning of the spring semester. We’ve fallen in love with this ministry and the students it represents. For our first Women’s Fellowship program of the year, we decided to invite Kristen Reynolds, the women’s director of the campus ministry along with any female students who wanted to come to a home-cooked pot luck dinner. My own daughters have told me how special it is to get off campus once in a while into a real home, a real church with real food. For the college student, it’s good to mingle with people of all ages and remember there’s a real world out there beyond the ivory towers of the academic campus. 30 of us forgot how old or young we were–we just enjoyed a meal and each other. To Kristen’s and our surprise, ten college girls, including an international student who had arrived in the States only three weeks ago, opted to leave campus on a foggy Monday evening to drive thirty miles to a church and small town they’d never been to before to mingle with women old enough to be their mothers and grandmothers. Never in our wildest dreams would anyone in our Western Illinois farm town imagine that we would have someone from Saudi Arabia walking our church halls, asking questions about Jesus! After the meal, the students introduced themselves and shared how we could pray for them. Then Kristen told about the continuing impact of the Cookie Outreach. In my blog about Anne, the lady who made iced sugar cookies in spite of severe physical limitations, I told how one student lingered at the cookie table, asking questions, wanting to know why the free cookies. Answers led to more questions. He attended the next CSC meeting. Kristen told us that particular student has now become a regular participant in the campus house bible study. “It took one of 900 cookies to draw someone closer to Christ,” she told our group with some emotion. Her next story turned on my emotions. Sometime after the Cookie Outreach, a campus apartment building across the street from the CSC Campus House caught on fire. Without even asking permission, the Campus House residents headed straight for the freezer where the rest of the 900 cookies were stashed and took several bags to the students who were burned out of their apartments. In his parable of the sower, Jesus told how seed that falls on fertile soil can produce a hundred, sixty, or thirty times what was sown. I have news for you. The soil at university campuses is not hardened soil. There are pockets, large pockets of good soil waiting to hear the Word of God, longing to see it lived out in the lives of believers. It doesn’t matter who those believers are as long as they are authentic, sincere, and committed enough to love beyond the limits of schedule and familiarity. The crazy counterpoint of all this is that you think you are doing god things for a group of college students. Instead, a group of nineteen church ladies left the building that night so incredibly blessed. Our evening has been the talk of the church all week long. Our church could so easily say, we’re located too far away or most of our members are too old. But I’ve learned this: support ministry to college students is as simple as loving them like your own kids and then letting God write the rest of the story. Our job was to just love on those college girls for an evening, fix their favorite home-cooked meal, and answer their questions about Jesus. Oh, and don’t forget the cookies. Rest of the story? Maybe I should say the continuing story. I’m sitting on the edge of my chair, waiting to see the ripple effect from our latest venture. Waiting to see how God will use a church pot luck take home box to call the nations to Himself. I’ll let you know!